Bhikkhus of the two chapters of Malwatte and Asgiriya conduct daily worship in the inner chamber of the temple. Rituals are performed three times daily: at dawn, at noon and in the evenings. On Wednesdays, there is a symbolic bathing of the relic with an herbal preparation made from scented water and fragrant flowers called Nanumura Mangallaya. This holy water is believed to contain healing powers and is distributed among those present. The temple sustained damage from bombings by Janatha Vimukthi Peramuna in 1989 and by Liberation Tigers of Tamil Eelam in 1998 but was fully restored each time. After the parinirvana of Gautama Buddha, the tooth relic was preserved in Kalinga and smuggled to the island by Princess Hemamali and her husband, Prince Dantha on the instructions of her father King Guhasiva. They landed on the island in Lankapattana during the reign of Sirimeghavanna of Anuradhapura (301-328) and handed over the tooth relic. The king enshrined it Meghagiri Vihara (present day Isurumuniya) in Anuradhapura. Safeguard of the relic was a responsibility of the monarch, therefore over the years, the custodianship of relic came to symbolize the right to rule. Therefore, reigning monarchs built the tooth relic temples quite close to their royal residences, as was the case during the times of the Anuradhapura Kingdom, Kingdom of Polonnaruwa, and Kingdom of Dambadeniya. During the era of the Kingdom of Gampola, the relic was housed in Niyamgampaya Vihara. It is reported in the messenger poems such as Hamsa, Gira, and Selalihini that the temple of tooth relic was situated within the city of Sri Jayawardenepura Kotte when the Kingdom of Kotte was established there. During the reign of Dharmapala of Kotte, the relic was kept hidden in Delgamuwa Vihara, Ratnapura, in a grinding stone. It was brought to Kandy by Hiripitiye Diyawadana Rala and Devanagala Rathnalankara Thera. King Vimaladharmasuriya I built a two-storey building to deposit the tooth relic and the building is now gone. 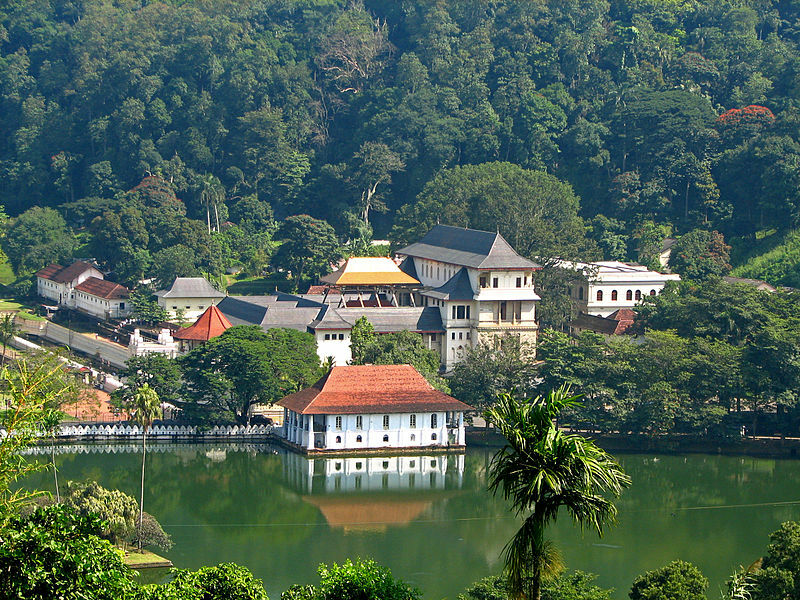 In 1603 when the Portuguese invaded Kandy, it was carried to Meda Mahanuwara in Dumbara. It was recovered in the time of Rajasinha II and it has been reported that he reinstated the original building or built a new temple. The present-day temple of the tooth was built by Vira Narendra Sinha. The octagonal Paththirippuwa and moat were added during the reign of Sri Vikrama Rajasinha. The royal architect Devendra Moolacharya is credited with building the Paththirippuwa. Originally it was used by the king for recreational activities and later it was offered to the tooth relic, it now houses the temple's library. The temple has been attacked on two occasions, in 1989 by the Janatha Vimukthi Peramuna and in 1998 by the militant organization Liberation Tigers of Tamil Eelam. The brick wall which runs along the moat and Bogambara lake is known as water waves wall. Holes in this wall are built to light coconut oil lamps. The main entrance gate which lies over the moat is called Mahawahalkada. At the foot of Mahawahalkada steps, there is a Sandakada pahana (moonstone) which is carved in Kandyan architectural style. Mahawahalkada was totally destroyed in a 1998 bomb blast and rebuilt afterward along with Sandakada pahana other stone carvings. Elephants are depicted in stone on either side of the entrance. A Makara Torana and two guardian stones are placed on top of the staircase. Hewisi drummers' chamber is situated in front of the main shrine. The two storeys of the main shrine are known as "Palle malaya" (lower floor) and "Udu malaya" (upper floor) or "Weda hitina maligawa". The doors of the Weda Hitana Maligawa are Ivory carvings. The actual chamber in which the tooth relic is kept is known as the "Handun kunama". The golden canopy over the main shrine, built in 1987 by Prime Minister Ranasinghe Premadasa, and the golden fence which encircles the main shrine are other notable features. The tooth relic is encased in seven golden caskets which are engraved with precious gemstones. The caskets have a shape of a stupa. The procession casket which is used during the Kandy Esala Perahera is also displayed in the same chamber. The royal palace is situated to the north of the temple. John Pybus, who was on an embassy in 1762, gives a detailed description on the royal palace. Vikramabahu III of Gampola (r. 1356-1374) and Sena Sammatha Wickramabahu of Kandy (r. 1469-1511) built royal palaces on this site. Vimaladharmasuriya I of Kandy undertook various decorations to the palace. The Dutch orientalist Philippus Baldaeus visited the palace with General Gerard Pietersz Hulft in 1656. The royal residence was known as "Maha Wasala" in Sinhalese starting in the Polonnaruwa period. The royal palace is also known as "Maligawa." There were three Wahalkadas and an 8 feet (2.4 m) high wall used as main entrances. The section of the palace facing the Natha Devale is said to be the oldest. During the beginning of the British period, it was used by government agent Sir John D'Oyly, 1st Baronet, of Kandy. Successors of D'Oyly have continued to use it as their official residence. Today it is preserved as an archeological museum. Ulpen Ge and Queens Palace are the associated buildings of the palace. Mahamaluwa is public who came to see the annual Esala perahera. Today it contains a statue of Madduma Bandara. The memorial of which contains the skull of Keppetipola Disawe another attraction. The statue of Princess Hemamali and Prince Dantha are also located here. ^ Wickrematunge, Raine (2 December 2001). "I was a member of the JVP team that attacked the Dalada Maligawa". The Sunday Leader. Colombo. Retrieved 9 April 2012. ^ "1815:Kandyan convention and the role of D'Oyly". sundaytimes.lk. (in Sinhala) Abeywardena, H.A.P. (2004). Kandurata Praveniya (1st ed.). Colombo: Central Bank of Sri Lanka. ISBN 9789555750929. (in Sinhala) Seneviratna, Anuradha (1989). "Dalada Maligawa". In Vethara Mahinda Thera. Kanda Udarata Mahanuwara (Sinhala translation ed.). Colombo: Ministry of Cultural affairs (Sri Lanka).